Matt Crafton, driver of the No. 88 Ideal Door/Menards Toyota Tundra made his 16th-career start at Michigan International Speedway (MIS) in Saturday’s NASCAR Camping World Truck Series (NCWTS) LTi Printing 200. Starting from the pole position, the ThorSport Racing drivers third at the 2-mile D-shaped oval, Crafton led the 30-truck field for 10 laps, but lost the lead on lap 11 battling a, “free” Toyota Tundra. The Menards driver continued to work on the balance of his Tundra through the ensuing pit stops, at the end of Stages 1 and 2, finishing second, and fourth, respectively in each Stage. Restarting the final 34 lap Stage from the 13th position, Crafton worked his way inside the top-10 early, running as high as third, but would settle for a sixth-place finish behind race winner, Darrell Wallace, Jr. The top-10 result is Crafton’s seventh top-10 finish at MIS. The NCWTS had two practice sessions on Friday in preparation for Saturday’s LTi Printing 200 at MIS. Matt Crafton was first, and third-quick, respectively, in both sessions. The ThorSport Racing driver earned his third Keystone Light Pole award at MIS on Saturday, and the 13th of his career, for the 100-lap event. 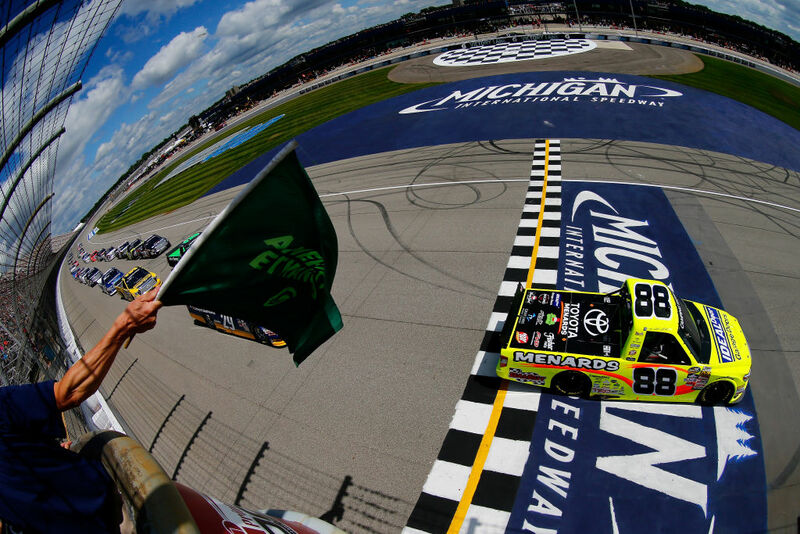 Starting first, Crafton finished second in Stage 1, fourth in Stage 2, and sixth in the LTi Printing 200 at MIS. In 16 starts at the 2-mile D-shaped oval, Crafton has earned three poles, and has led 63 laps en route to three top-five and seven top-10 finishes. In 13 starts in 2017, the Menards driver has led 106 laps en route to one win (Eldora), three top-five (Atlanta), and nine top-10 finishes. In 397 career starts, Crafton has 13 poles, and has led 2241 laps en route to 14 wins, 100 top-five, and 235 top-10 finishes. Crafton’s ThorSport Racing teammates finished eighth (Enfinger), 11th (Rhodes), and 21st (Coughlin).